Cranfield University research into the removal of synthetic chemicals from biogas has been recognised by the Worshipful Company of Engineers for excellence in engineering that benefits the environment. The PhD research project, which is looking at the most effective methods for removing these chemicals – called siloxanes - from waste materials, should help improve the cost effectiveness of facilities used for generating energy from waste. Siloxanes are widely used to soften, smooth, and moisten in products such as shampoos and moisturisers and in medical implants, building sealants and lubricants. The research received the Worshipful Company of Engineers Hawley Award recognising excellence in engineering that is helping to improve the environment. Siloxanes that end up in our wastewater do not decompose in the sewage system so find their way into the waste matter that remains following the sewage treatment process. They then turn into silicon dioxide, or sand, during the process of burning this waste for biogas and ‘green energy’, which blocks engines and causes costly damage to facilities. 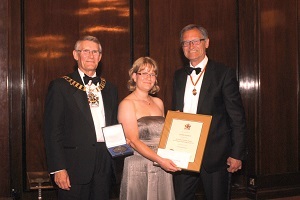 Caroline was presented with the Hawley Award and a cheque for £5,000 at the Worshipful Company of Engineers’ Annual Awards Dinner, on Tuesday 9 July 2013 at Merchant Taylors’ Hall, London, by Sir George Cox, Board Member of NYSE-Euronext and Director of Shorts, the aerospace company.